We served our fruit on a platter after our July 4th dinner. Some of us made fruit cones, some dipped the fruit right into the cream and some of us made our own red, white and blue parfaits. You can’t see it but there are strawberries and bananas in there too! A delicious combination. This is not an exact recipe. Use as much fruit as you need for the amount of people you are serving. The recipe for the cashew cream makes 2 cups and that goes a long way. Drain the cashews and then add them, plus the new water, and the rest of the ingredients into the blender or Vitamix and whip until creamy and smooth. Taste and adjust. Hull the strawberries and cut in half. * Slice the bananas and sprinkle with a touch of freshly squeezed lemon juice. This will prevent the bananas from browning. 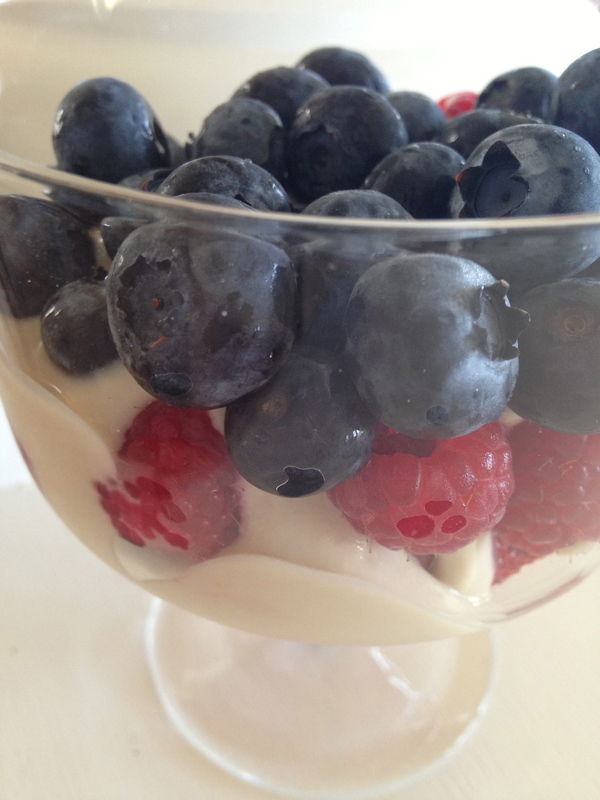 To make parfaits, layer the strawberries and rasberries on the bottom of a parfait dish or wine glass. Next, layer the bananas. Using a ladle, pour the cashew cream over the bananas. Top with blueberries. Enjoy!